What does Renisha McBride have to do with Tariq Kdheir? For young people across the country, everything. Last spring, The Nation launched its biweekly student movement dispatch. As part of the StudentNation blog, each dispatch hosts first-person updates on student and youth organizing. For recent dispatches, check out July 1 and July 14. For an archive of earlier editions, see the New Year’s dispatch. Contact studentmovement@thenation.com with tips. Edited by James Cersonsky (@cersonsky). Tariq Khdeir is a 15-year-old Palestinian-American living in Tampa, Florida. Earlier this month, he went to visit family in Palestine around the same time his cousin, Muhamad Abu Khdeir, was made to swallow lighter fluid and set on fire by Israeli forces. While attending a peaceful rally in support of Muhamad, Tariq was arrested and brutally beaten by Israeli police, then kept on house arrest. His parents and protesters around the world called for his return home; he was eventually released amid escalating attacks on Gaza from the Israeli military. On July 11, Dream Defenders in Tampa held a press conference with other youth, including Tariq's peers, outside the city's courthouse, demanding his safe return and an end to collective punishment of the Palestinian people by Israeli forces. Outside Florida's capitol—where legislators are pushing anti-BDS legislation limiting people's ability to protest Israeli apartheid this spring—Tallahassee Dream Defenders and Florida State University's Students for Justice in Palestine rallied against the ongoing Israeli assault on Gaza and called for an end to US government sponsorship of Israel. 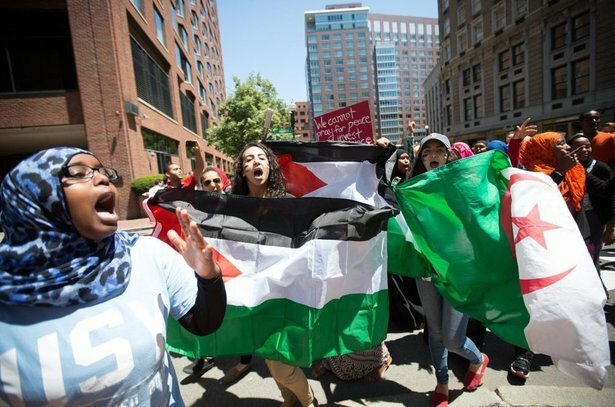 Throughout July, students across California have participated in demonstrations opposing attacks on Gaza, including the largest Palestine solidarity rally in LA history. Earlier this month, the Daily Californian revealed that Avi Oved, the student nominee to the UC Board of Regents, had solicited funding from anti-Muslim political activist Adam Milstein for his prior campaign for student government at UCLA. Following the revelations, the UC Student Association voted to postpone his nomination, Jewish students spoke out against Hillel's facilitation of these donations and students across the UC spoke out against the corrupting influence of outside funding on student governance and against Oved's connection to an Islamophobic donor. During its July meeting, the UC Regents accepted Oved's nomination, despite the UCSA vote, a statewide petition of over 700 students and waves of public comment opposed to his nomination. Regents could see Oved as an ally in the effort to slow or stop the BDS movement at UC. On July 12, the Freedom Side, a collective of progressive student and youth organizations, converged on the National Governors Association meeting in Nashville to demand our governors stop the separation of families through mass incarceration, deportation and laws that criminalize black and brown communities. We silently marched through downtown Nashville and protested outside the Omni Hotel, the site of the NGA meeting. Five of us, from the Ohio Student Association and the Dream Defenders, were arrested and detained for six hours without just cause and subjected to strenuous conditions at the hands of Tennessee state troopers. With the help of supporters in Nashville and across the country, we were released. The Nashville 5 and Freedom Side are determined to organize our communities and campuses and challenge our elected representatives who so far have failed us. Our lives matter. On Monday, July 21, members and allies of Fresno Immigrant Youth in Action gathered at Congressman Jim Costa's office in Fresno to kick off a statewide campaign, Migrant Lives Matter, led by the California Immigrant Youth Justice Alliance and Immigrant Youth Coalition. In a region heavily populated by farm workers and immigrant families, Costa, a Democrat, has not spoken on behalf of our communities: he did nothing to stop the deportation of forty people to dangerous conditions in Honduras; he hasn't pressured President Obama to use his executive power to grant administrative relief for the 11 million undocumented people in the country; and he has stated that activists need to switch our focus to the Republican Party. Our campaign is targeting all Democratic representatives to take action—or be placed on a "deportation party" list. At Costa's office, we delivered a letter and requested a response by the end of the month; later, he stated that will set up a meeting and work with us. On July 21, Dreamers from across the country converged on Washington, DC, to represent the thousands of undocumented immigrants in the state of North Carolina and the millions across the country, including my mother. We came with a message for Ted Cruz and the Republican Party as a whole: You are irrelevant, and the GOP is dead to our community. The GOP killed immigration reform. Now, amid the humanitarian crisis at the border, the GOP is advocating to get rid of DACA and leave Dreamers like myself under the threat of deportation. We went from office to office, holding funeral services in front of each, leaving a mock coffin at the door and letting legislators know that their shameful politicalization of the crisis to attack us will not stand. On the Unite to Fight–On the Road to Southern Movement Assembly IV road trip, July 10 to 18, ten community activists traveled to ten cities for a series of movement building events with community groups fighting to build a South where young people aren’t afraid to walk in their own streets and schools for fear of being targeted, harassed and killed. We witnessed the intersection of our struggles, from formerly and currently incarcerated people in Alabama and students fighting for the right to healthy food in our schools in Atlanta to environmental racism in Rocky Mount, North Carolina and gentrification and public space in Durham. Over the next month, we will bring this conversation to youth assemblies in Jacksonville, Florida, and Atlanta, Georgia, during Standing Our Ground Week and Southern Movement Assembly IV. Thanks to a misleading title on the 2012 ballot, calling the proposed construction of a new youth jail a “Children and Family Justice Center,” King County, Washington, voters approved a plan to replace the King County Juvenile Detention Facility with a new $210 million facility. A group in Seattle, Youth Undoing Institutional Racism/End the Prison Industrial Complex, is fighting to stop the proposed construction with our No New Youth Jail Campaign. On June 11, we hosted a community night with more than 200 people and marched to King County headquarters to protest the new youth jail. On August 8, we will be giving a televised presentation on youth criminalization and the new jail to elected officials. 9. How Long Can HWS Colleges Ignore Sexual Assault? In May, the federal Office of Civil Rights listed Hobart and William Smith Colleges as one of fifty-five universities under investigation for mishandling of sexual assault cases under Title IX. On July 13, the New York Times published an article detailing the story of a student at HWS who was raped by three football players in late September—all of whom were found not guilty by an institutional review board. For the past year, students and faculty at the Colleges have been mobilizing around issues of sexual violence through organizations including the Sexual Violence Task Force and the Coalition of Concerned Students. We have pressured the administration to provide a resource center for survivors, a student staffed support hotline, transparency about policy and process and policy changes. Upon release of the article, an alumni-led group, HWS Community for Change, has joined the mobilization, demanding changes to the Colleges' reporting processes, additional support for survivors and improved trainings. 10. When Will Justice for Eric and Renisha Be Served? On Thursday, July 24, alongside local and national partners including the NAACP Legal Defense Fund, Communities United for Police Reform, Freedom Side, RaceForward, ColorOfChange and the Ella Baker Center, the Million Hoodies Movement for Justice hosted a Twitter town hall on #JusticeforEricGarner and #RememberRenisha—and police brutality, gun violence and surveillance affecting communities of color.